Not the Corryhully Horseshoe. 25th November 2018. 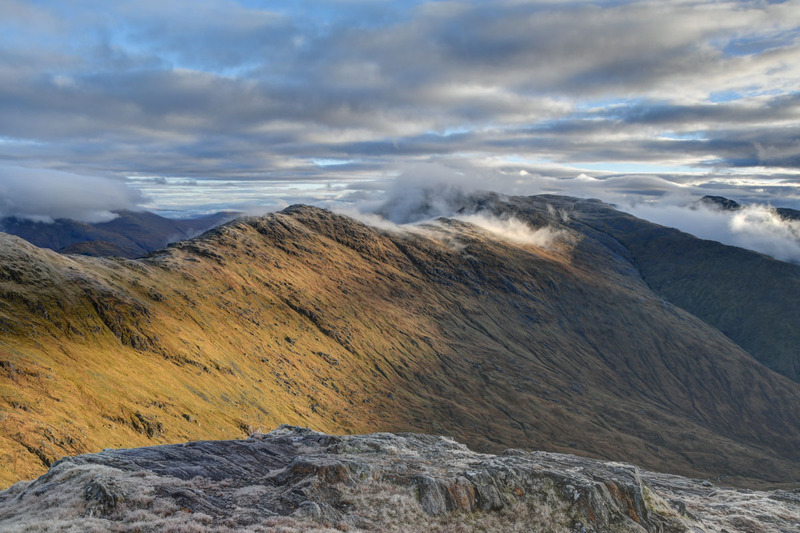 Forecast for Sunday was a little windier, but clearer hills in the west and north-west, with the area south of Loch Monar looking the best bet. We were swithering between Gulvain and Corryhully. Decided on the latter due to the better views. Kicked off well before dawn. There was a bright moon, so the walk up Glenfinnan on the tarmac estate road needed no artificial light. Clear skies above us boded well for the day, although we could just about make out some cloud on the hilltops by moonlight. The Corryhully round clockwise takes a good quality stalkers path from NM 918 852 up to the foot of Sgurr a Choire Riabhaich. We were up at about 600m by dawn (0826). 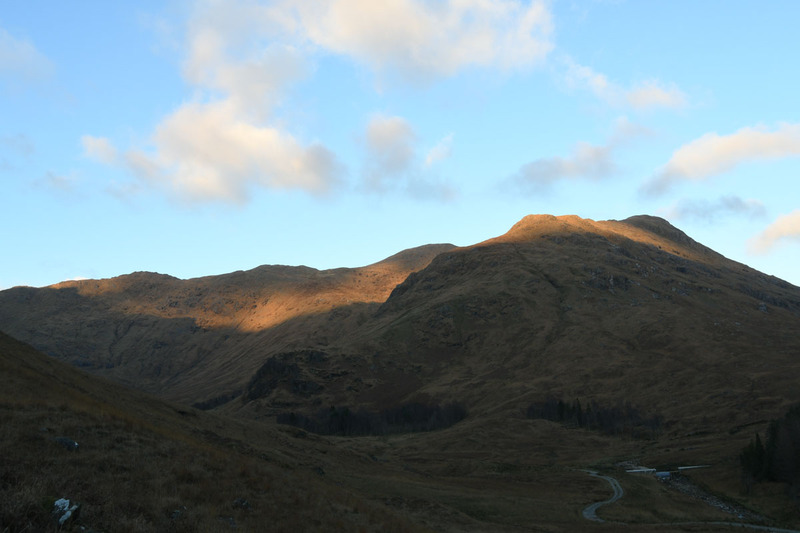 The sun was rising behind Beinn an Tuim so we knew that we needed height to get any sunlight. 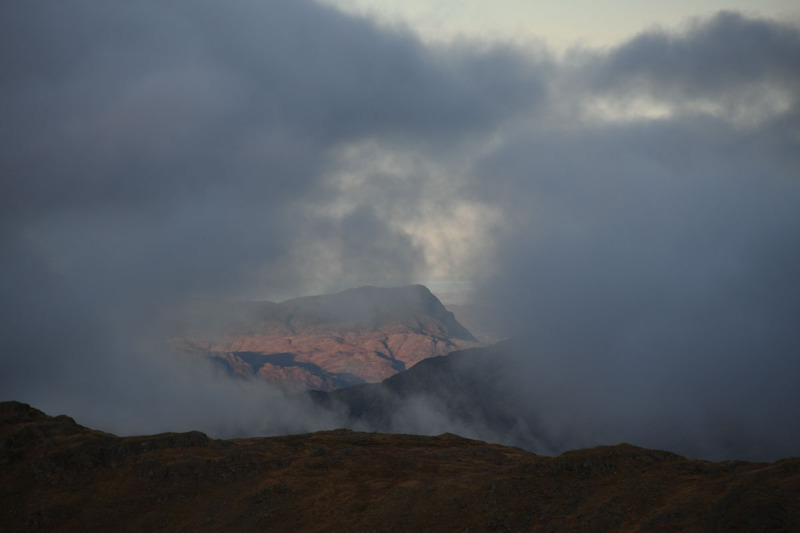 The absence of sun on the hills above us indicated that there must be cloud to the SE, but with clear sky above Beinn an Tuim it looked like the sun would arrive shortly…..
….or not. Cloud began to build up from the east. A little reminiscent of our first visit in 2005 where clear skies gave way to an inversion lapping over the Horseshoe. 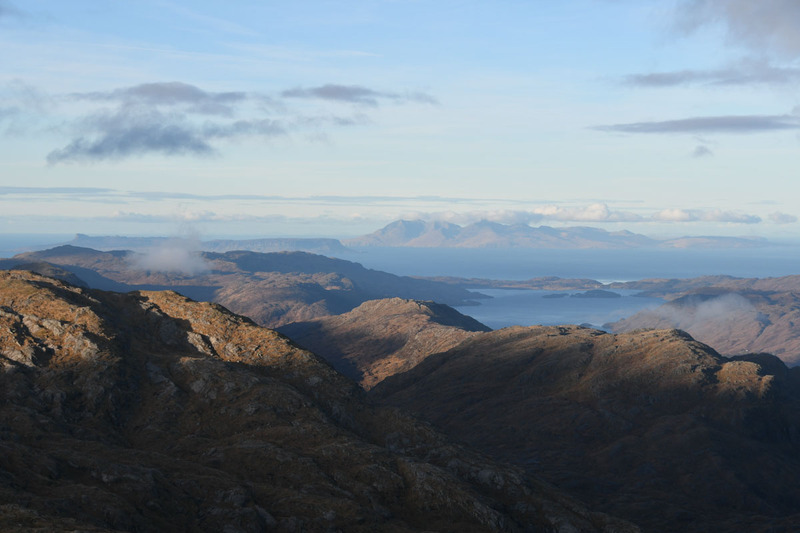 About 10 minutes of views from the Munro before the inversion rose up and swallowed us. Watched a Golden Eagle flying in from the north perform a couple of display stoops before disappearing down towards Coire Carnaig. Happily the summit was clear of cloud and we had a decent view out to sea. 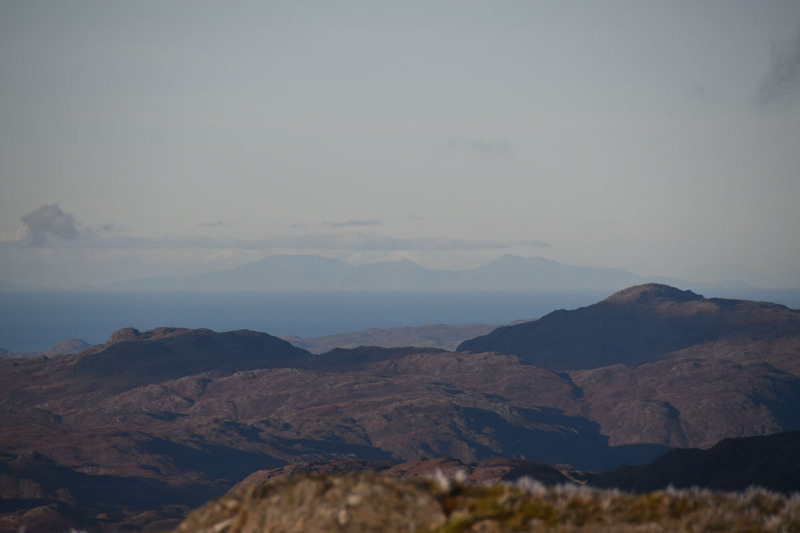 A cracking view of Rum, Eigg and Skye, with South Uist clearly visible beyond. No view of the hills to our north and east however, we were out of the cloud streamers at least. 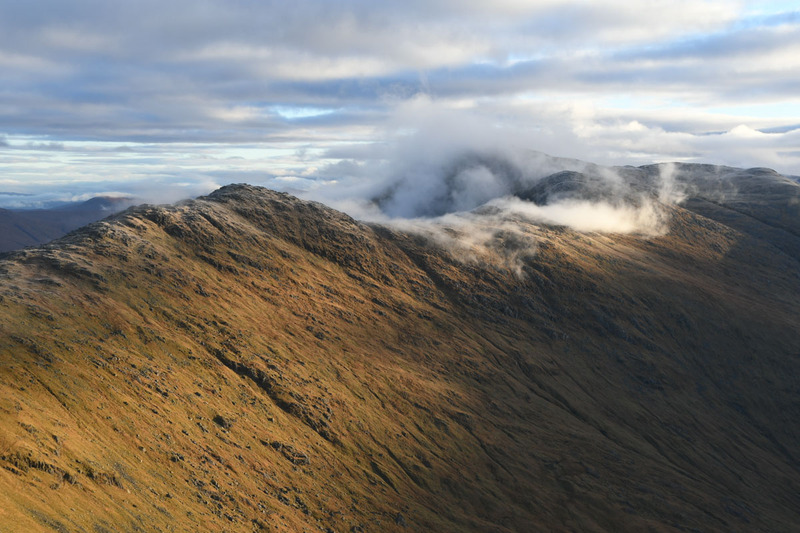 We had already planned to head west from Coireachan to Beinn Gharbh. It is only 50cm off Corbett prominence and had been almost visited on our 2012 trip from Coireachan to An Stac. There’s not much more bothersome than an almost visited hill. 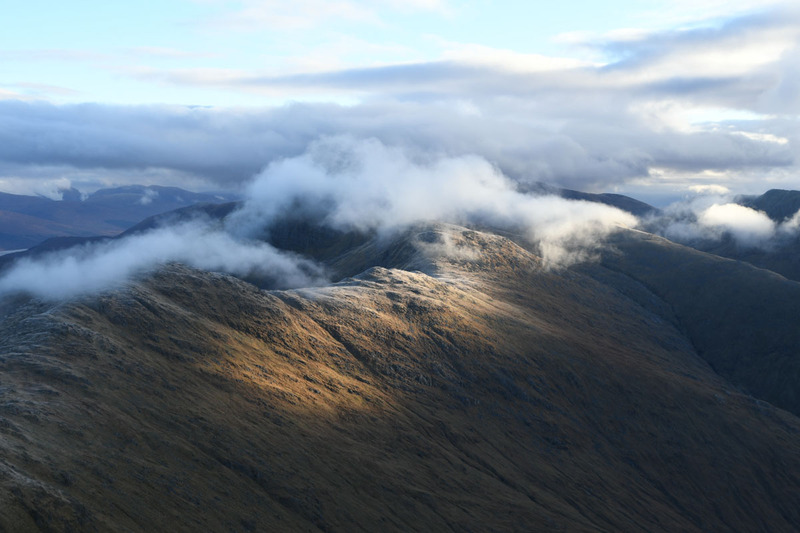 Dropped west off the munro across the ridge to Beinn Gharbh. 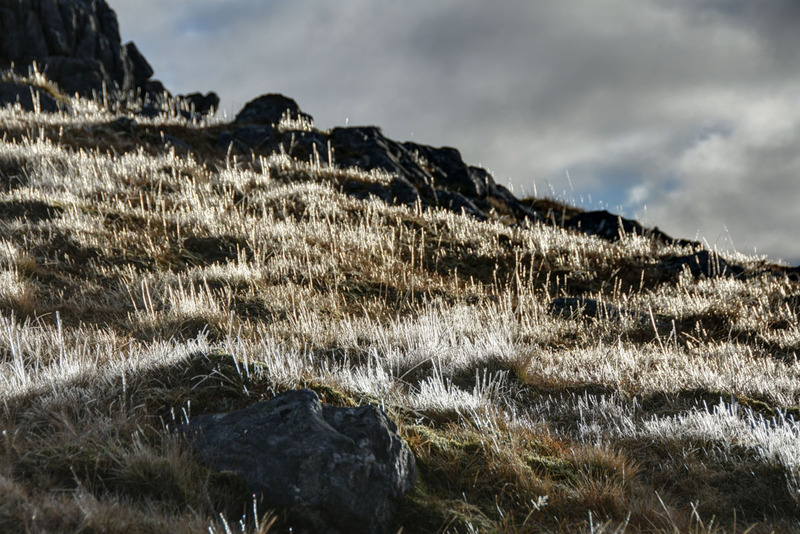 Occasional sunshine gave some nice effects on the iced up grasses. 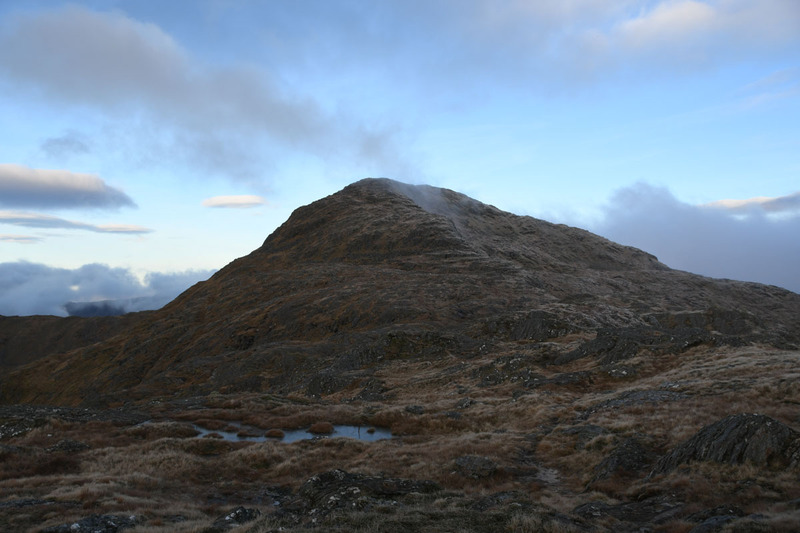 Takes a little bit of weaving to get across the ridge and up the 149.5m reascent to Beinn Gharbh. It’s a nice viewpoint. 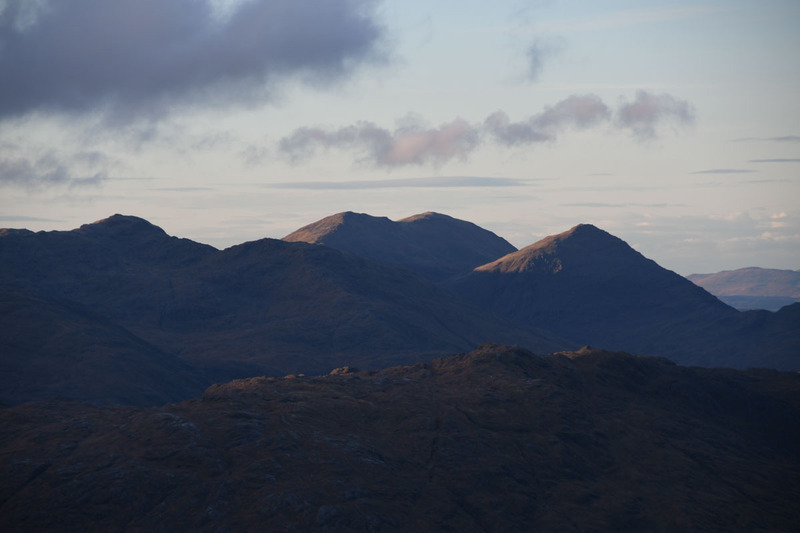 An Stac is well seen, usually a rather hidden away Graham. 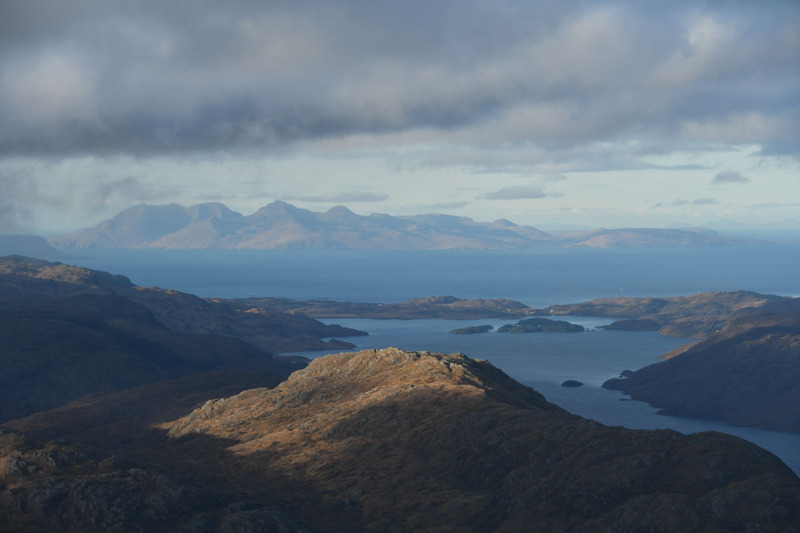 It’s also got a nice angle on Rum over the west end of Loch Monar. 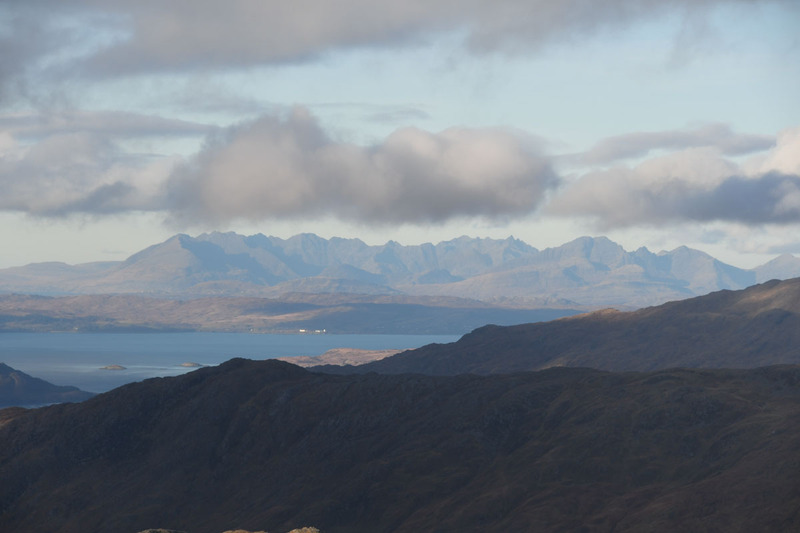 The Skye Cuillin and Blaven tower over Sleat and Sabhail Mor Ostaig. 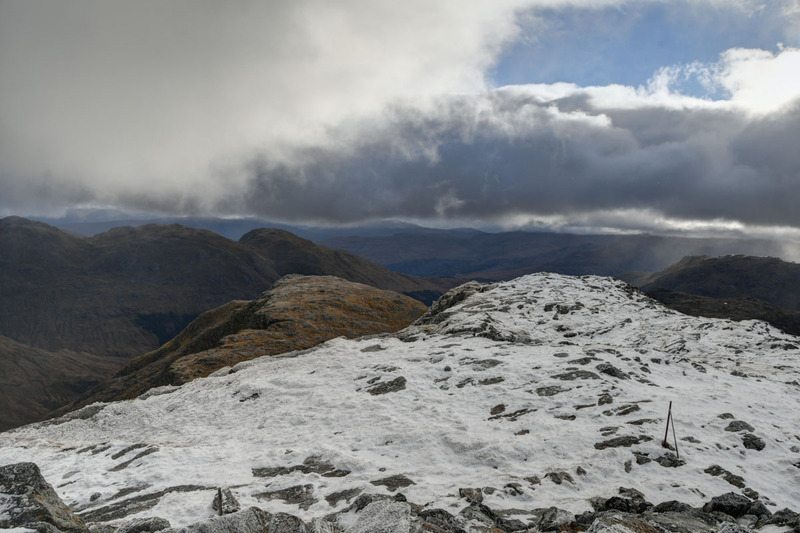 The wind was keen and bitingly cold on Beinn Gharbh, the summit was the windiest point of the day. We sheltered on the west side for lunch before turning for home. 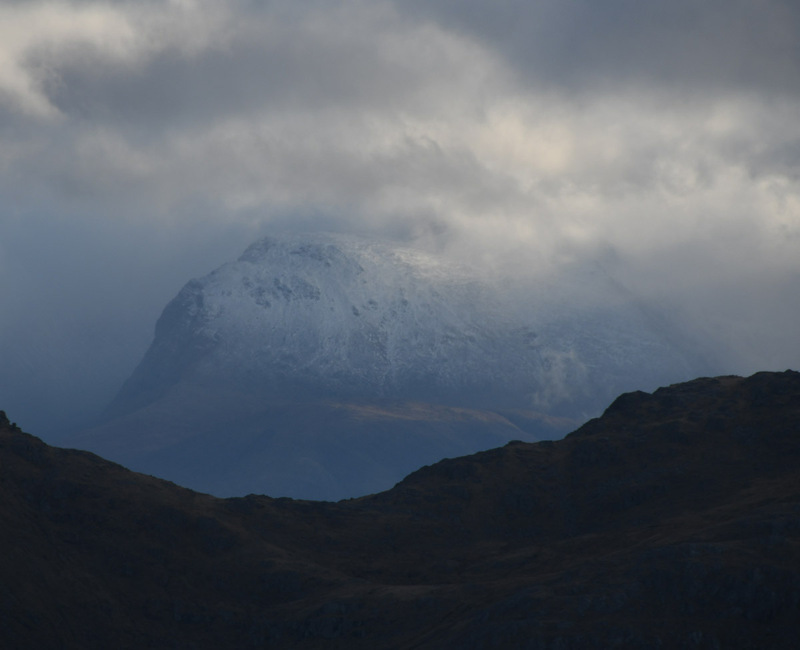 As we left Ben Nevis was visible looking quite moody. 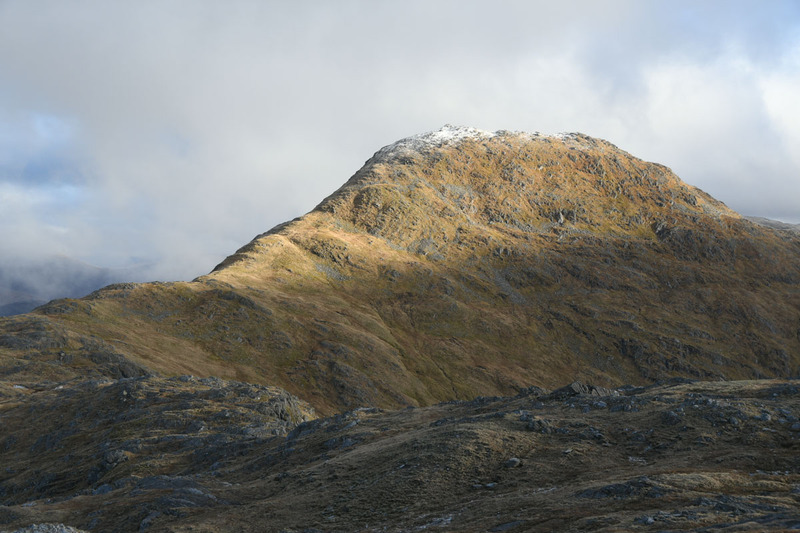 Sgurr nan Coireachan caught a little sunshine as we returned. 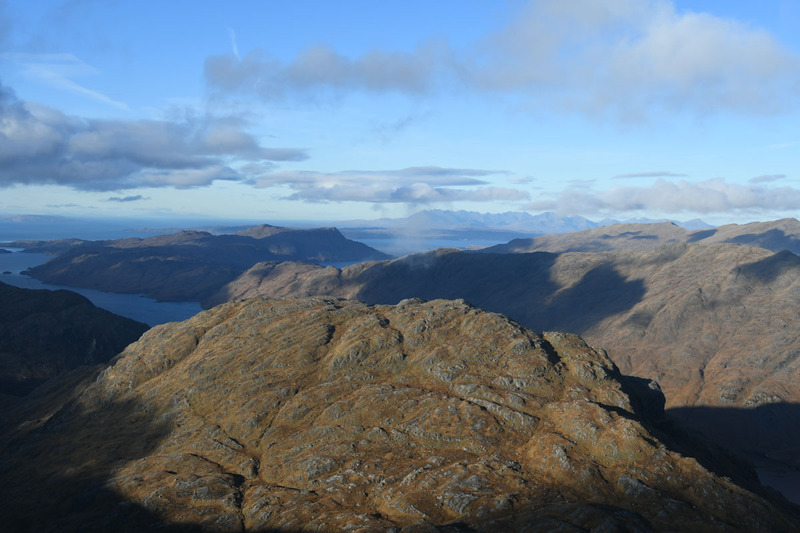 A Golden Eagle (possibly the same one) flew by to loop round the north of the Munro). 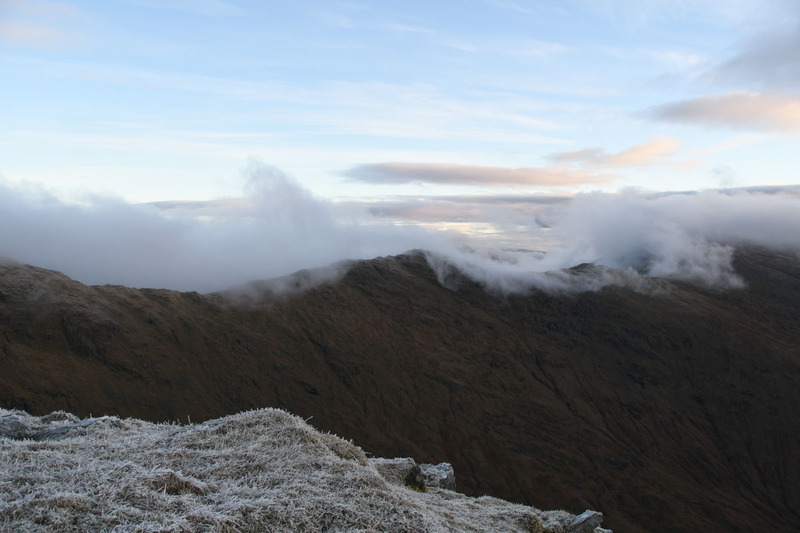 Back to the summit of Sgurr nan Coireachan, it remained rather moody with no views of the hills to the north. 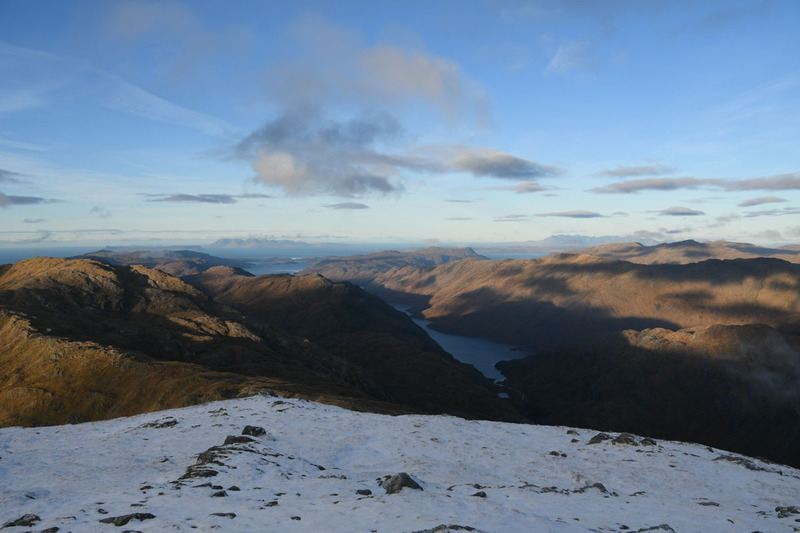 Nice to get above the snow line, even if the summit was only 30m above the snow line! Having had the place to ourselves, suddenly there were 2 pairs of other walkers converging from opposite directions on the summit. We headed back by the route of ascent, all 6 of us making broadly similar progress down the hill. It takes a while to get downhill. 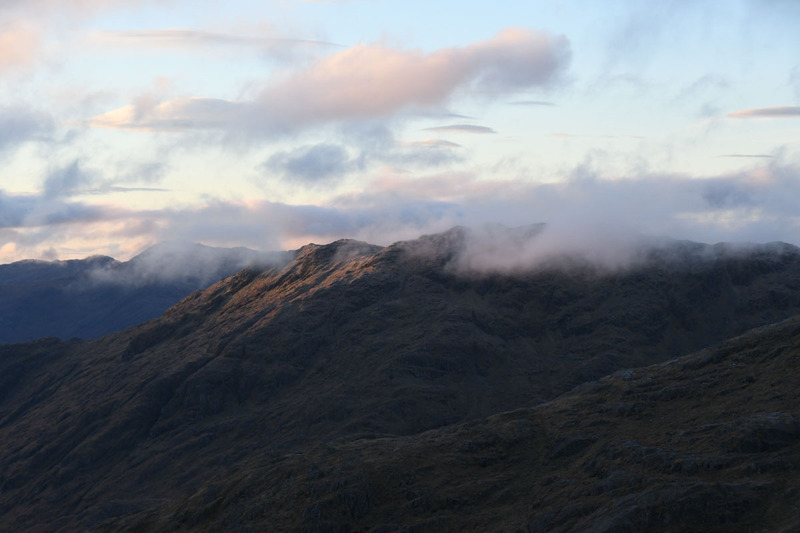 By the time we reached the glen the clouds were clearing and the sun was setting behind Sgurr an Utha. A quick yomp 5km back to the car, arriving before the last light faded away. 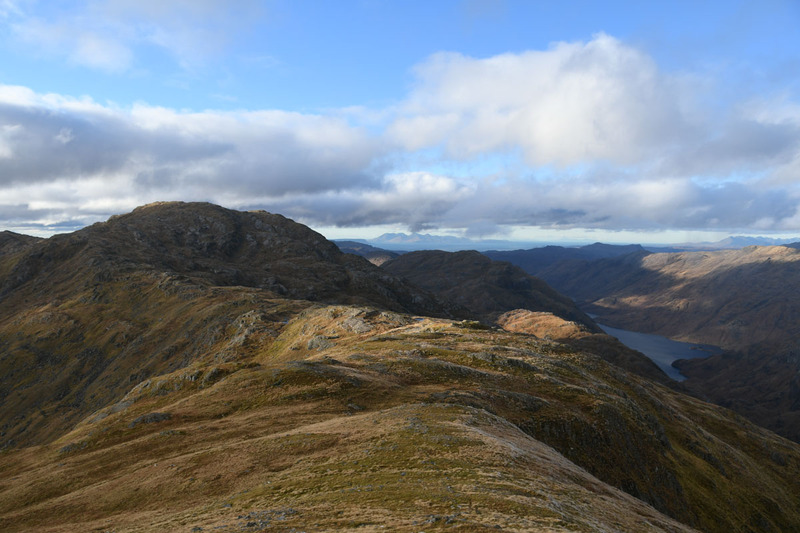 Quite a good walk, overall similar distance/climb to the 2 Munro horseshoe, but the dog-leg to Beinn Gharbh is quieter and has better seaward views. May well revisit this one sometime – although we definitely got superb views out to sea, we still need to get the rest of the view from these hills. 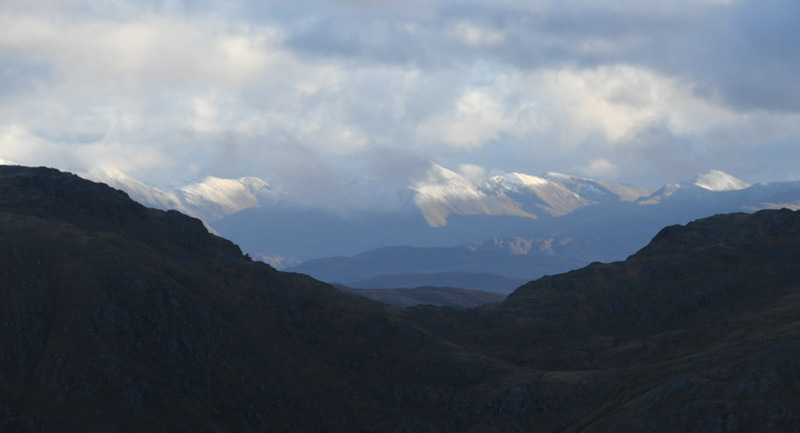 Another nice enough day Kinley, I’ve still to visit these Munros .. It makes my day to see an eagle as well, I’m always on the lookout for them. ..
Enjoyable post. I’ve got half a plan to cover some of this ground next April. I hope the weather is kind as parts of it look complex. Thanks for posting. ← Creag Bhan near Lochailort. Saturday 24th November 2018.